A 94 run sixth-wicket partnership from Matt McGillivray and Jacob Mulder helped CIYMS to a four wicket win over CSNI at Stormont on Saturday, and moved them one step closer to lifting the Robinson Services Premier League title. 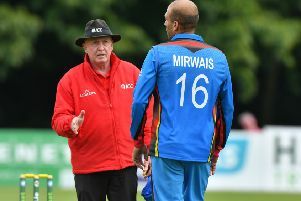 CIYMS captain Nigel Jones won the toss and elected to bowl on what looked like a wicket that would favour the seamers, and they started with great control, not giving CSNI batsmen Marc Ellison and Archie Johnston much to work with at all. Having collected 997 runs for the 2018 campaign before the game started, Ellison moved to the magic 1000 mark with a single down to third man. He became the fourth to reach the landmark in what has been a fantastic season for batting. With CSNI sitting on 21-0 after eight overs, CIYMS were building a considerable amount of pressure and they got their reward when Allen Coulter bowled Johnston for 10 - marking his 38th wicket of the season. Jones then got in on the action by trapping Ellison LBW for 11. And when Matt McGillivray bowled fellow overseas professional Andre Malan for 7, CSNI were 36-3 and their visitors were in total command. James Kennedy and Aaron Wright began to rebuild but McGillivray would strike again in the 22nd over, bowling the former for 21 to leave CSNI sitting on 65-4. Wright has produced consistent performances throughout the season, with that being recognised by the Northern Knights when he earned his First Class debut earlier this summer, and he was looking very comfortable. Morgan Topping has also been one of the standout performers for CSNI in 2018, and the pair put on 38 for the fifth wicket before spinner James Cameron Dow struck to remove Topping for 9. The 21-year-old Wright was the key to holding the innings together, and he would have been disappointed when he chipped back to Cameron Dow on 44. Corin Goodall decided that he was going to attack the CI bowlers, and raced to 29 from 25 balls before he was caught off the bowling of Mulder trying to go for another boundary. It was clear that CSNI were always going to fall short of a total near par, but with Malan the highest wicket taker in the Union, they were looking to get at least in the region of 200 to give themselves a chance. Therefore, a lot of credit must go to Andrew Cowden and Ben Adair, who put on 49 for the ninth wicket to get their side to 195-8 from 50 overs to give CIYMS something to think about. McGillivray was the pick of the bowlers, finishing with 3-35 from his 10 over spell. The home side got their defence off to the perfect start when John Matchett was caught at point for 6 off the bowling of Adair, and they almost had a second when new batsman Jones skied one off Malan, but the very tough running chance was put down. Jones and Chris Dougherty were beginning to set a platform for the chase, with the latter dealing in boundaries, including 14 from a single Topping over. Kennedy decided to bowl Malan straight through for his 10 over spell, and that turned out to be a fantastic call as the South African bowled Jones for 17 before doubling the dose by dismissing Ryan Hunter for 2. After slicing a four past the slips, Dougherty was smartly caught by Kennedy in the same position off the very next ball when on 34 to give Malan a third. And he then collected his fourth shortly after when Jason van der Merwe edged behind for 12. Malan ended his spell with 4-44, and now has 43 wickets to go with his 900+ runs to mark an incredible debut season in the NCU. McGillivray and Jacob Mulder came together with the score at 82-5. And with 114 runs needed to win, CSNI would have been confident of the position they were in. But the duo batted superbly under pressure and took the game away from their opposition. Mulder, 94 runs later, was bowled by Topping for 38, but McGillivray seen the job through, ending on 64*. That victory is a massive one in regards to the league title. A CSNI win could have brought Waringstown right back into the mix, but CIYMS now retain their advantage at the top. Jones’ side now face Waringstown next weekend at The Lawn. A win there would all but seal the title before they face CSNI and Armagh in their last two games.